The Flathead real estate market continues to improve with near record number of sales in 2016! This number of sales coupled with subdivision activity near all-time lows has motivated a renewed interest in development. 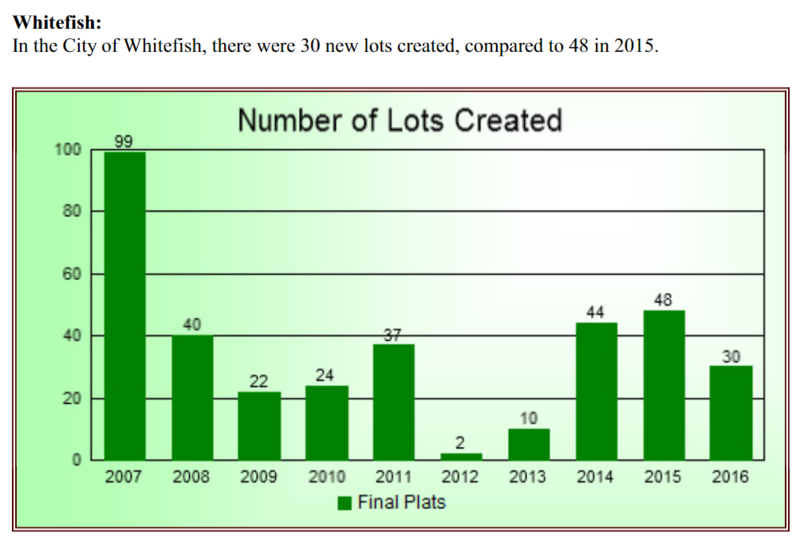 Although all the county’s towns show an increase in the number of sales, the largest increase was in Whitefish. There was an 11% increase in the number of residential units built from 2015 to 2016. This number has shown a healthy increase every year since the bottom of the recession in 2011. Over those 5 years, the total increase in annual residential construction in the Flathead Valley was over 200%. So, here is an important message for all our clients who may be considering putting your home on the market…there’s rarely been a better time!! If priced right, these statistics say you won’t have much competition so; your home should sell readily. Call your RE/MAX Rocky Mountain real estate professional for a review and market analysis of your property. From a potential buyer’s standpoint, here are some helpful statistics: Nationally, we just completed 34 years of consistent interest rate declines. That is obviously not going to continue. In 2016, the overall average 30-year mortgage interest was 3.7%. Currently the 30-year rate is 4.1%. Still, that remains very near record lows. As you are aware, the Federal Reserve recently increased the Fed Funds rate a quarter of a percent. There may be two or three similar rate increases in the coming twelve months. Even at that, the mortgage rates will still be near historically record lows. Given these statistics, if you are considering a real estate purchase, there is ample reason to lock in your mortgage rate as soon as possible. In summary, we have an extremely healthy market for anyone thinking about selling their home and plenty of motivation to not wait if you are considering a purchase. We at RE/MAX Rocky Mountain Real Estate would consider it a privilege to assist you with any of your real estate needs. We have offices in both Whitefish and Columbia Falls and have been serving our real estate clients in all the Flathead Valley sub-markets for over 20 years.